If you are taking steroids for asthma, you may wonder how long steroids stay in your system. It will vary whether you are taking inhaled steroids, such as Advair, or oral corticosteroids such as prednisone, and the characteristics of each medication. A big factor in how long any drug affects your body is the drug's half-life. In very simple terms, the half-life of a drug is the time it takes for half of the drug to be eliminated from your body. Not surprisingly, drugs with longer half-lives stay in your system longer. Drugs with a shorter half-life stay in your system for a shorter period of time and may need to be dosed multiple times per day. While half-life is mostly related to the properties of the drug, there are sometimes individual differences between patients that may make one drug work on you for a longer or shorter period of time compared to the average patient. For example, the half-life of rescue inhalers like albuterol is in the 5- to 7-minute range while the half-life of Advair is 5 to 7 hours. A number of different things can affect the half-life of a drug including age, gender, liver disease, kidney disease, and hydration. It is also important to understand what steroids are not. Steroids for asthma are not the same as steroids that you hear athletes taking to improve performance or bodybuilders to bulk up. In the treatment of asthma, steroids are an anti-inflammatory agent. Oral corticosteroids sometimes referred to as oral steroids or even by a brand name such as prednisone, are a group of very strong anti-inflammatory medications that are prescribed when you have a significant worsening of your asthma symptoms. They may be used over several days to help get your symptoms under control. 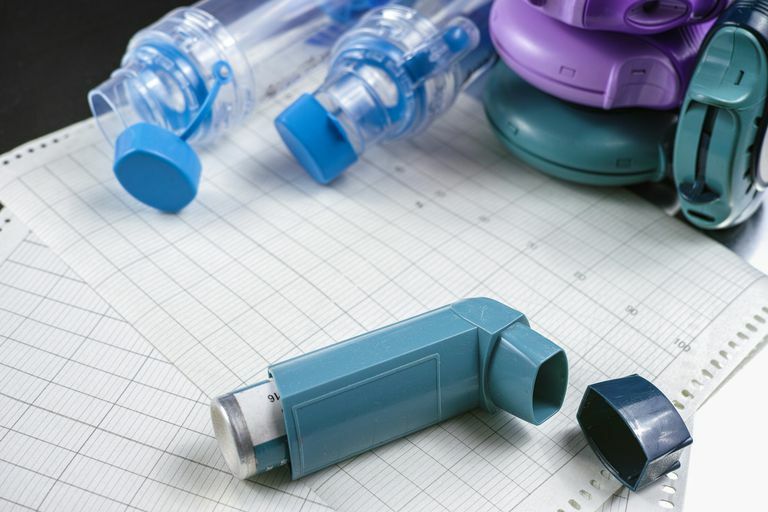 If your doctor needs to prescribe oral corticosteroids more than once per year, your asthma control is probably suboptimal and you and your doctor need to examine your asthma action plan. It is helpful to understand the differences between this group of steroids and inhaled steroids. Oral corticosteroids are systemic—meaning they reduce inflammation throughout the entire body. Inhaled steroids, on the other hand, act primarily in the lung. It is especially important to mention any recent steroid bursts to all your healthcare providers. The oral steroids may prevent your adrenal gland, where your body's natural steroids are made, from working correctly. As a result, your body may not make steroids sufficiently during a time of stress and you may require additional supplementation. Inhaled steroids rarely cause these side effects, but do have local side effects that are easily prevented with appropriate steps. Patients and parents of children with asthma often have concerns about steroids. Write down your questions and concerns to discuss with your doctor or your child's pediatrician. Don't be afraid to ask, doctors and pharmacists want you to have all of the information you need to take your medications properly. It's important for safety and for your asthma plan. Expert Panel Report 3 (EPR3): Guidelines for the Diagnosis and Management of Asthma. National Heart, Lung, and Blood Institute. https://www.nhlbi.nih.gov/health-pro/guidelines/current/asthma-guidelines/full-report. How Long Will My Inhaler Last? What Is The Difference Between Inhaled and Oral Corticosteroids? Do Macrophages Impact Your Asthma?